If using a pacemaker, be sure to read the manual of the pacemaker before using the key, as the radio waves of the key may affect the pacemaker. (a) In addition to conventional mechanical key and wireless door lock control functions, the smart key system enables door locking/unlocking, steering lock releasing and engine starting without operating the key. The only requirement is that the key is in the user's possession. This system is controlled by the certification ECU (smart key ECU assembly). When the certification ECU (smart key ECU assembly) detects the presence of the smart key system in one of the detection areas, it identifies and checks the ID code, and outputs operation signals to the related ECU in accordance with their functions. The detection areas are formed by 6 oscillators (2 door oscillators, 1 outside oscillator and 3 indoor oscillators). The interior detection area of the indoor electrical key oscillators (for front, center and rear floor) is formed when the driver door is opened or closed, when the engine switch is pushed, when a warning is activated, or when the lock sensor on the door outside handle assembly or lock switch on the back door opener switch assembly is on. The exterior detection area formed by the door electrical key oscillators (for driver and front passenger side) and outside electrical key oscillator (for rear side) is approximately 0.7 to 1.0 m (2.30 to 3.28 ft.) from the door outside handle assembly of the front doors, or the center of the rear bumper. The exterior detection area of the door electrical key oscillator (for driver or front passenger side) is formed by transmitting a request signal every 0.25 seconds while the engine switch is off and each door is locked. In this way it detects the proximity of a key. When locking the door using the lock sensor on the door outside handle assembly, the detection area is formed when the lock sensor is touched. The exterior detection area of the outside electrical key oscillator (for rear side) is formed by when the back door opener switch assembly (opener or lock switch) is on. Outputs information such as the key ID and vehicle ID when request signals that are output by the indoor, outside and door oscillators are received. Outputs a request signal when the lock, unlock or panic on the key is pushed. Outputs information such as the key ID and vehicle ID when the radio wave that is output by the transponder key amplifier in the engine switch is received. Has an integrated mechanical key that can be used to unlock the doors when the key battery is weak. Certifies the ID code received from the door control receiver and transmits the certification results to the steering lock ECU (steering lock actuator assembly). Controls the oscillators and touch sensors. Transmits the door lock/unlock request signals during the entry function. Receives the request signal from the certification ECU (smart key ECU assembly) and actuates the door lock motors to unlock or lock all the doors. Transmits the condition of each door and, the back door to the certification ECU (smart key ECU assembly). Sends a door unlock request signal to the certification ECU (smart key ECU assembly) when the touch sensor on the inner side of the front door outside handle assembly is touched. Sends a door lock request signal to the certification ECU (smart key ECU assembly) when the lock sensor on the front door outside handle assembly is touched. Receives the request signal from the certification ECU (smart key ECU assembly), and creates a detection area around the front doors. Receives a request signal from the certification ECU (smart key ECU assembly) and forms the interior detection area. Receives the request signal from the certification ECU (smart key ECU assembly), and forms a detection area around the back door. Receives the ID code from the key and transmits it to the certification ECU (smart key ECU assembly). When a key enters the door electrical key oscillator detection area, foot light is illuminated in accordance with a request signal of the certification ECU (smart key ECU assembly). Transmits a back door open request signal to the certification ECU (smart key ECU assembly). Transmits a back door lock request signal to the certification ECU (smart key ECU assembly). Outputs state of the brake pedal to the main body ECU (driver side junction block assembly). Illuminates simultaneously to inform the driver of malfunctions in the smart key system. The following warning messages appear to alert the driver. Sounds to inform the driver of malfunctions in the smart key system. The key consists of a mechanical key, transmitter for wireless door lock control and transceiver for the smart key system. The transceiver function for the smart key system receives the signals from the oscillators and sends the ID code to the tuner. The transmitter function for the wireless door lock control has a lock switch, unlock switch or panic switch. This mechanical key works for the driver door and glove box, but cannot start the engine. A total of 7 keys can be registered. Each oscillator transmits the request signal received from the certification ECU (smart key ECU assembly), and forms a key detection area to detect the presence of a key. 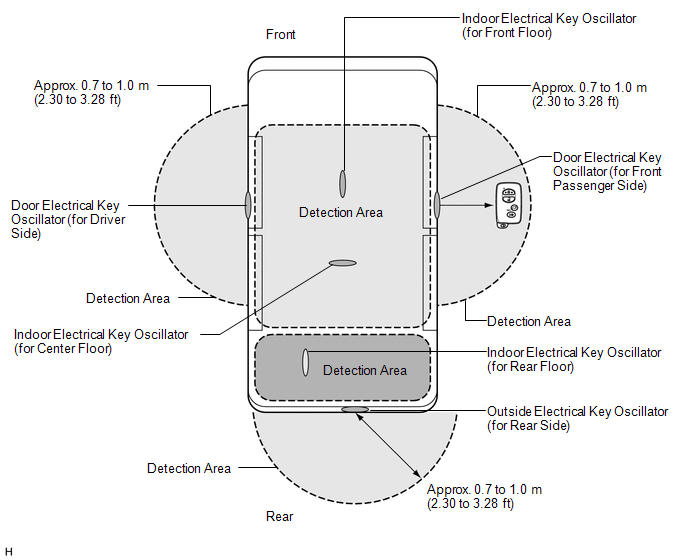 The detection area formed by each door electrical key oscillator and outside electrical key oscillator (for rear side) is approximately 0.7 to 1.0 m (2.30 to 3.28 ft.) from the door outside handle assembly of each door or the center of the rear bumper. The detection area of each door electrical key oscillator is formed by transmitting a request signal every 0.25 seconds while the engine switch is off and each door is locked. In this way, the oscillator detects the proximity of a key. During entry lock, the detection area is formed with the lock sensor on. The detection area of the outside electrical key oscillator (for rear side) is formed when the back door opener switch assembly (opener or lock switch) is on. The detection area of the indoor electrical key oscillators (for front, center and rear floor) is formed when any door is opened or closed, during engine start, when a warning is activated, or when the lock sensor on the door outside handle assembly or lock switch on the back door opener switch assembly is on. This function is a convenient system for locking and unlocking all the doors and back door at a distance. The operation of this function is the same as that in the wireless door lock control system. When a key enters the exterior detection area of the door electrical key oscillators (for driver and front passenger side), the foot lights illuminate. When a key is in the exterior detection area of any door electrical key oscillator, the door will unlock after the inner side of either front outside door handle is touched. The front door outside handle assembly (for driver side) unlocks the driver door. The front door outside handle assembly (for front passenger side) unlocks all doors and the back door. Allows switching between 2 modes that can be operated with the entry unlock function. When a key is in the exterior detection area of a door electrical key oscillator (driver or front passenger side) and the engine switch is off, all doors can be locked by simply touching the lock sensor on the door outside handle assembly. When a key is in the exterior detection area of outside electrical key oscillator (for rear side) and the engine switch is off, all doors can be locked by simply pressing the lock switch on the back door opener switch assembly. When a key is in the exterior detection area of the outside electrical key oscillator (for rear side), the back door opens manually by simply pressing the back door opener switch assembly (opener switch). The key confinement prevention function prevents the vehicle from being locked with a key left inside. The engine is left running and the shift lever is in a position other than P when the driver gets out of the vehicle. The engine is left running and the shift lever is in P when the driver gets out of the vehicle. The engine is left running when a passenger gets out of the vehicle while holding the key. The key is not in the detection areas. The key is left in the vehicle. The key battery is weak. The steering lock does not release. The steering lock mechanism is malfunctioning. The power management control ECU is malfunctioning. Engine cannot be started (driver error). Engine cannot be started (system error). An attempt is made to turn off the vehicle with the shift lever in a position other than P or N*. Auto power off operation occurs*. Immobiliser system certification completion occurs. The vehicle is driven without a key. If the key remains within the exterior detection area of any electrical key oscillator (for driver, front passenger or rear side), the system maintains periodic communication with the key. Therefore, if the vehicle remains parked in that state for a long time, the key battery and the vehicle battery could be drained. This function enables the registration (writing and storing) of transmitter recognition codes in the EEPROM that is contained in the certification ECU (smart key ECU assembly). Push the lock/unlock/panic switch on the key to operate each function. For details, (See page ). (a) When the key enters any exterior detection area of a front door, the certification ECU (smart key ECU assembly) judges and certifies the key ID code received from the door control receiver assembly. (b) After the key certification OK is confirmed, the certification ECU (smart key ECU assembly) transmits an unlock stand-by signal to the touch sensor of the relevant door. (c) At the same time, the certification ECU (smart key ECU assembly) transmits the lighting signals to the foot lights on the outside rear view mirror and interior lights (engine switch illumination and interior lights) to turn them on (Entry Illumination Function). (d) If a touch sensor is touched in this condition, the certification ECU (smart key ECU assembly) transmits a door unlock request signal to the main body ECU (driver side junction block assembly), and unlocks either the driver door or all doors. The front door outside handle assembly (for front passenger side) unlocks all doors. (e) The main body ECU (driver side junction block assembly) sounds the wireless door lock buzzer twice, and the main body ECU (driver side junction block assembly) flashes the hazard warning lights twice, as an answer back for entry unlock. (a) The entry lock signal is transmitted to the certification ECU (smart key ECU assembly) when the user (who has the key in their possession), exits the vehicle and touches the lock senor on the door outside handle assembly or presses the lock switch on the back door opener switch assembly. (b) The certification ECU (smart key ECU assembly) transmits a request signal for the indoor electrical key oscillators (for front, center and rear floor), door electrical key oscillators (for driver and front passenger side) and outside electrical key oscillator (for rear side) to form detection areas. (c) The certification ECU (smart key ECU assembly) judges and certifies the ID code. It then checks the location of the key and, if all doors are closed, the ECU transmits a door lock signal to the main body ECU (driver side junction block assembly). (d) The main body ECU (driver side junction block assembly) receives this signal and actuates the lock motors. (e) The main body ECU (driver side junction block assembly) blinks the hazard warning lights once and the main body ECU (driver side junction block assembly) sounds the wireless door lock buzzer once as an answerback for the entry lock function. (a) The unlock signal is transmitted to the certification ECU (smart key ECU assembly) from the back door opener switch assembly. (b) The certification ECU (smart key ECU assembly) transmits a request signal for the outside electrical key oscillator (for rear side) to form detection area. (c) The key receives this signal and returns the ID code to the door control receiver assembly. (d) The certification ECU (smart key ECU assembly) judges and certifies the ID code, and check the location of the key. The ECU transmits a back door open signal to the main body ECU (driver side junction block assembly). (e) Any ECU receives this signal and actuates the motor to open manually the back door. (a) The key confinement prevention function prevents the key from being locked in the vehicle. (1) When the door is locked by the lock knob in the inside door handle while the key is still the in vehicle interior, the main body ECU (driver side junction block assembly) receivers this signal and transmits the door condition signal to the certification ECU (smart key ECU assembly). (2) The certification ECU (smart key ECU assembly) transmits a request signal for the indoor electrical key oscillators (for front, center and rear floor) to form detection area. (3) The key receives this signal and returns the ID code to the door control receiver assembly. (4) The certification ECU (smart key ECU assembly) judges and certifies the ID code, and check the location of the key. The ECU transmits a door unlock signal to the main body ECU (driver side junction block assembly). (5) The main body ECU (driver side junction block assembly) receives this signal and actuates the all door lock assemblies to unlock. (6) The certification ECU (smart key ECU assembly) sounds the wireless door lock buzzer and buzzer in the combination meter as an answer back for unlock. When a person carrying the key enters the detection area, the door will enter unlock standby mode and the front map light will illuminate. The entry illumination function operates when the key enters the exterior detection area from outside the detection area. If the key does not remain out of the detection area for 3 seconds or more, the illumination function does not operate. (1) When any of the situations below occur, the smart key system causes the certification ECU (smart key ECU assembly) to sound a buzzer in the combination meter assembly and the wireless door lock buzzer, a message to appear on the multi-information display, and the engine switch illumination to operate in order to alert the driver. The power management ECU is malfunctioning. There are 2 patterns for situation A. The engine switch is in a mode other than off. The vehicle speed is above 0 mph (0 km/h). Under the situation of pattern 1, the driver closes the door and attempts to leave the vehicle while holding the key. The shift lever is in any position except P.
The key is not in the vehicle. Key is returned the vehicle. There are two patterns for situation B. When the driver door is open, the driver turns the engine switch from on (IG) to off and attempts to leave the vehicle. The engine switch is on (ACC) and the driver door is opened. The engine switch is off, the steering is unlocked, and the driver door is opened. The engine switch is turned off and the steering is locked. There are 2 patterns for situation C.
When the engine is left running and the shift lever is in P, the driver closes the driver door and attempts to leave the vehicle while holding the key. The key is returned to the vehicle. The key is not in the vehicle (within one of the detection areas). The following warning message is displayed for 60 seconds (and then automatically turned off). 10 seconds have elapsed after the wireless door lock buzzer was activated. The any door is opened. The lock sensor on the door outside handle assembly is on (touched). When the engine is left running, a passenger leaves the vehicle while holding the key. When the key is not in the vehicle or the key battery is dead, the driver attempts to start the engine or turn the engine switch on (IG). The engine switch is pushed. Check if the key is in the detection area. If the key is in the detection area, press the wireless door lock switch and confirm that the indicator comes on. If the indicator does not come on, replace the key battery with a new one. There are two patterns for situation G.
The lock sensor on a door outside handle assembly is touched to perform entry lock with the key left in the vehicle. The key is in the vehicle. With a door open and the key in the cabin, the lock knob is locked and then the door is closed with the door handle being pulled. The vehicle is driven using a key that has a low battery. The key battery voltage is low. The following warning message is displayed for 15 seconds (and then automatically turned off). The key battery is replaced with a new one. The steering lock cannot be released. The steering lock cannot be released, thus the engine is prevented from starting. The green indicator blinks at 1-second intervals (goes off automatically after 30 seconds). The engine switch is pushed while the steering wheel is turned left and right, and the steering lock successfully disengages. A malfunction of the steering lock ECU (steering lock actuator assembly) is detected. A malfunction of the steering lock ECU is detected. The amber indicator blinks at 2-second intervals (goes off automatically after 15 seconds). The steering lock ECU returns to normal. A malfunction of the power management control ECU is detected. A malfunction of the power management ECU is detected. The power management control ECU returns to normal. There are two patterns for situation L.
A warning message appears on the multi-information display when the driver does not follow the proper procedure to start the vehicle. Driver door is closed → opened. The engine switch is turned from off to on (ACC) more than twice with the engine off and brake pedal not depressed. The following warning message is displayed for 10 seconds (and then automatically turned off). The engine switch is pushed with the brake pedal depressed. A message indicating how to start the engine appears on the multi-information display when the shift lever is in a position in which the engine cannot be started. More than 0.5 seconds have elapsed after the engine switch was turned on (IG). The engine is not cranking. The shift lever is moved to P or N.
The engine switch is turned off or on (ACC). There are two patterns for situation M.
When the engine switch is pushed, the key cannot be detected in the vehicle two times in a row. The immobiliser system is set. When the engine switch is turned on (ACC) or on (IG) , a certification error occurs two times in a row. The immobiliser system certification result is OK.
Key certification in the vehicle has stopped either because 30 seconds have elapsed after any of the doors is opened and closed, or because the brake pedal is depressed. The driver attempts to start the engine after performing a driver door key linked unlock operation. A driver door key linked unlock operation is performed. The shift lever is in any position other than P or N.
The engine switch is turned from on (IG) to on (ACC). The engine switch is turned to a mode other than on (ACC). The engine switch is turned a other than off. A warning message appears on the multi-information display when a key with a depleted battery is touched to the engine switch while depressing the brake. *3: This situation occurs following situation M.
A warning message appears on the multi-information display when the vehicle starts moving without the registered key in the vehicle interior. When vehicle speed is detected after the key is removed from the vehicle, the warning is activated (only for first time). A wireless door lock control signal (lock, unlock) is input and the ID code matches. A user carries the key and touches a lock sensor on a door outside handle assembly. The driver door is locked or unlocked by the mechanical key. In the smart key system, if the key is constantly in the exterior detection area of the doors, the system maintains periodic communication with the key. Therefore, if the vehicle remains parked in that state for a long time, the key battery and vehicle battery could be drained. For this reason, if this state continues longer than 10 minutes, the smart key system automatically becomes deactivated. A door is locked or unlocked by the mechanical key.